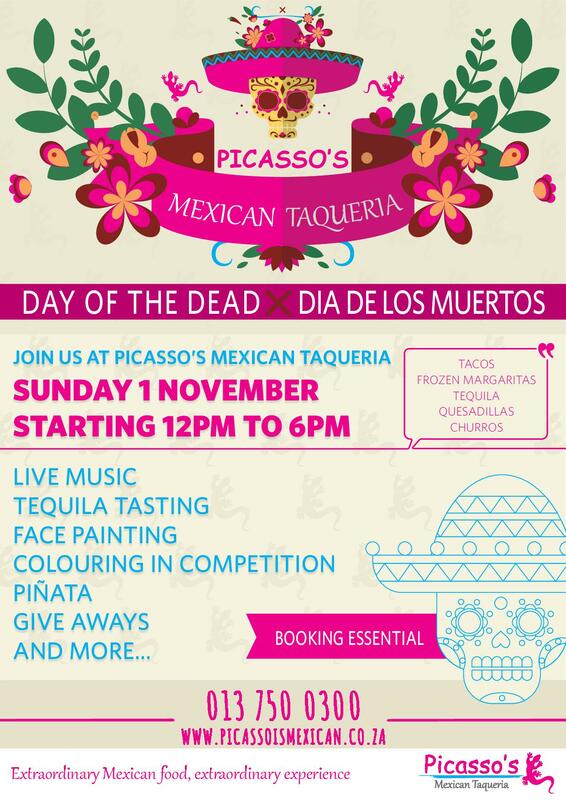 White River-based Picasso’s Mexican Taqueria is celebrating the Day of the Dead, a Mexican fiesta, in ghostly style on Sunday, 1 November, from 12h00 to 18h00. The Day of the Dead (Día de los Muertos in Spanish) is celebrated throughout Mexico on 1 and 2 November, in particular the central and southern regions, and is acknowledged around the world in other cultures. The fiesta focuses on gatherings of family and friends to honour deceased loved ones and to help support their spiritual journey. The 1st of November will always be a day to remember in White River as it is the anniversary of the date that the owners took over the premises and began renovating for the birth of Picasso’s Mexican Taqueria. 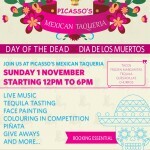 Join Picasso’s Mexican Taqueria in the celebration of the Day of the Dead and bring along your family and friends to enjoy live music, tequila tasting and plenty of photo opportunities. There’s also face painting and a sugar skull colouring in competition for the kids. Sugar skulls date back to the Colonial period in Mexico where they represented a departed soul and were personalised with names written in icing. Tons of fun will be had with the Piñata, with adult and kiddie prizes up for grabs, to keep the entire family entertained. Enjoy a variety of tacos and other tasty Mexican dishes, whilst loosing yourself in true Mexican flare. Booking is essential. For more information, contact 013 750 0300, email picasso@picassoismexican.co.za, visit www.picassoismexican.co.za and LIKE on Facebook.